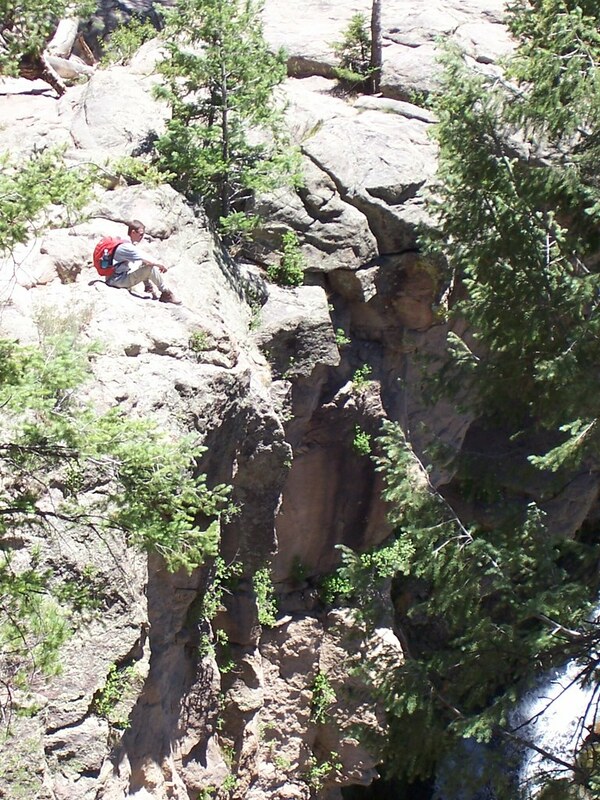 Sitting on the cliffs above Jemez Falls. What have I been doing with my time? Well I've got a lot of work done, read a couple of books and finally got my head round AJAX and PHP which is something I've been meaning to do for a while. I've also gone hiking a couple of times, and sat around in the sun more than I probably should have done. A better question is, what brought my "always connected" lifestyle to a screeching halt? Well my phone died, or rather two out of the three phones I was carrying out here died. Although it isn't actually the handsets that are the problem, after working intermittently on the drive up from Albuquerque, two out of my three SIM cards, both from Orange, stopped working. While they've worked perfectly happily everywhere else in the States I've ever been, they don't seem to like it out here in New Mexico. One will no longer register itself with the handset, and I suspect the SIM itself has fried. The other has a more subtle problem, and registers fine with the handset, but it gets an access denied error when trying to roam onto any of the available GSM networks. Orange customer service was of course totally useless, so I've shelved the entire thing as something I'll deal with when I get back home. But that means I'm was down to one ageing handset with a PAYG Virgin SIM. This of course almost immediately ran out of credit, as I'd only really intended it as a back-up, and it turns out I can't top it up while I'm out of the UK. I still have wireless access of course, but I'm not carrying my laptop around with me all the time, like I usually do, as I'm not allowed to take it on property at LANL. So at least in part my blogging vacation has in part been enforced, as I write a lot of blog posts from my phone these days as I've finally picked up a handset with a decent QWERTY keyboard, and the rest I write from my laptop in spare moments here and there. So have I learned anything from my enforced vacation? I'm going to try and pare down the number of feeds I'm reading, probably to around fifty or so, I guess I don't really need to know the latest Apple rumour half an hour before the major sites carry it. However I do miss the convenience of having a mobile phone, and perhaps unsurprisingly I miss text messages a lot more than I miss voice calls. It's amazing how much I've come to rely on the ability to send and receive 160 bytes any time I want or need it.